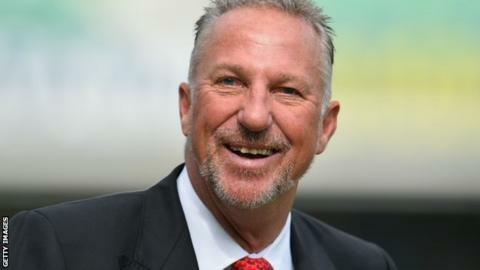 Former England all-rounder Sir Ian Botham is set to become chairman of Durham. Botham played for the county in their inaugural first-class season in 1992 and ended his career there the following year. Durham were relegated to Division Two of the County Championship last month over financial issues. "It is important that we all recognise the size of the task ahead," the 60-year-old said. Durham finished fourth in Division One of the County Championship this summer but were relegated after accepting a £3.8m financial aid package, which was approved by the England and Wales Cricket Board. The north east club also agreed a deal with Durham County Council over their debts, which will see £3.74m of loans from the council converted into shares, and will start next season with a 48-point deduction. Durham also face a four-point penalty in the 2017 T20 Blast and a two-point deduction in the One-Day Cup, and have lost the right to stage Test cricket at their Riverside ground. "As someone who lives locally it is an honour to have the opportunity to contribute to the club's future, to look forward and to continue to produce the talent that will serve both the county and England well in the years ahead," added Botham, who will take on the role when he returns from his media duties on England's forthcoming tour of India. "We will work closely with the ECB and Durham County Council in the months ahead as we develop a plan to ensure continued success for this great club." Botham, who also played for Somerset and Worcestershire, was England's leading Test wicket-taker, with 383 victims, for almost 30 years before being overtaken by James Anderson in April 2015. Follow your team with wicket alerts, sign up to news alerts or our newsletter and where to find us on social media. How to get into cricket - physical exertion with a chess-like element in matches which range from half an hour to five days.